WinterKids is a Maine nonprofit that teaches Maine children to move, learn and explore in the outdoors during winter. Since its founding in 1997, the organization has helped more than 100,000 Maine children to get outside and active with innovative outdoor education programs for preschools and elementary schools in Maine and New Hampshire. WinterKids provides children, families, schools and communities with 40+ programs and events each year. This year marks the organization’s 20th anniversary of WinterKids’ founding program, the WinterKids Passport, which has afforded thousands of Maine children the opportunity to learn to downhill and cross-country ski, ice skate, snow tube, and snowshoe at 50 participating winter sports partners across Maine. Other programs include Welcome to Winter Festival in Portland, WinterKids Challenge, WinterKids Winter Games, WinterKids FunPass and WinterKids Downhill 24. WinterKids is guided by its mission to help children develop healthy lifelong habits through education and fun outdoor winter activity. For more information, visit www.winterkids.org, or find WinterKids on Facebook, Twitter and YouTube. Olympic gold medalist and race founder Joan Benoit Samuelson is perhaps Maine’s most recognized athlete for her exploits at the 1984 Summer Games. This year, she will be welcoming two fellow Mainers who made their Olympic marks on ice and snow. Two-time gold medal-winning snowboarder Seth Wescott and luger Julia Clukey are both members of Team WinterKids and will be running the race on behalf of the organization and taking part in pre-race activities. And here’s a fun fact: Joanie used to babysit Seth. Speaking of the Olympics, the WinterKids Winter Games in January, held ahead of the 2018 Winter Olympics in South Korea, were a huge success. More than 4,200 kids and 230 teachers in all 16 counties in Maine competed for cash prizes in a four-week physical activity and nutrition challenge. Interviews with teachers and children who participated can be arranged. This year also marks the 20th anniversary of WinterKids’ founding program, WinterKids Passport, which provides free and discounted tickets, lessons and rentals at 53 recreation areas to Maine 5th, 6th and 7th graders, giving them an opportunity to choose a winter activity, from downhill and cross-country skiing to ice skating and snow tubing. WinterKids counts 75,000 Passport alumni over two decades – and with the launch soon of a mobile app for Apple and Android, in conjunction with the 20th anniversary, the program will become even more accessible…Karen Morgan, Maine’s Funniest Mom, is available to discuss the positive impact of the Passport program on her three children, who are each now high school and college competitive skiers. WinterKids also will bring a winter “cool” to the Kids Fun Run on Friday evening before the race. The event is scheduled to include snow cones for the kids, a boot toss with L.L.Bean’s Bootmobile, sweatbands and other WinterKids giveaways, and a photo/autograph booth set up for Maine Olympians Seth Wescott and Julia Clukey. The Kids Fun Run is set for 6 p.m. on Aug. 3 at the Soccer Field at Fort Williams. Media Contact: To make arrangements for a story, please contact Julie Mulkern at WinterKids – 207.871.5700 x102 or jmulkern@winterkids.org. And for more information, visit www.winterkids.org. An emergency portable solar power and water purification unit built this summer in Maine is stopping at the TD Beach to Beacon before shipping out to Puerto Rico to aid in ongoing disaster relief efforts. 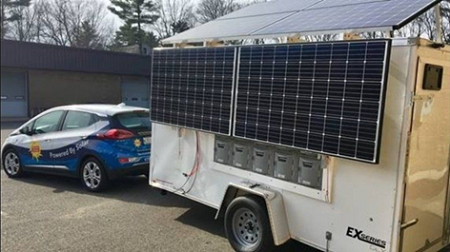 Solar installer ReVision Energy and solar electronics manufacturer Pika Energy – two Maine-based companies leading the transition to clean, renewable energy combined with battery storage in northern New England – have partnered to bring the solar-power trailer to Cape Elizabeth for the race. The trailer will be on display at the race Expo on Thursday and Friday, and then on race day, the plan is to utilize the trailer to provide clean, renewable electricity to power the post-race Awards Stage at Fort Williams Park. To date, ReVision has built and shipped three of the so-called 'Solar Outreach Systems' (SOS) to aid disaster relief efforts in Puerto Rico. The fourth SOS unit, built by ReVision and Pika volunteers here in Maine, will head out after the race. The unit utilizes a battery/inverter storage system from Pika. While the vast majority of Puerto Ricans have had their power restored at this point, there are still thousands of people in mountainous regions where it is logistically difficult to restore utility poles and wires. The three SOS units already there are aiding these remote, devasted communities that continue to lack access to power and clean drinking water in the wake of Hurricane Maria last September. Citizens are using the SOS units to charge cell phones, laptops and tablets and to purify drinking water. Each unit also has floodlights to provide nighttime lighting in darkened communities. Once power and clean drinking water are completely restored in Puerto Rico, the SOS units will be the property of www.amurtel.org, a global disaster relief agency that will re-deploy the SOS units at the next disaster to strike. 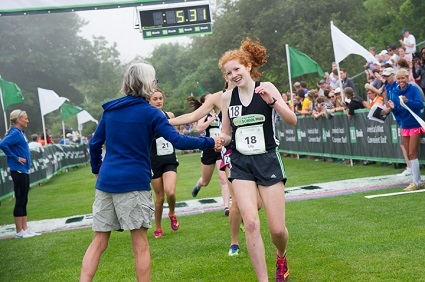 The TD Beach to Beacon High School Mile, presented by Oakhurst Dairy, is returning this year with an even bigger field of top young runners from across Maine. They come for the competition, but surely they also enjoy the pageantry, the swag and the chance to meet and speak to running legends. The Fort Williams event is set for 4 p.m. on Friday, Aug. 3 at the finish line area near the Portland Head Light. It is a two-loop course that finishes across the official TD Beach to Beacon finish line. Each race will be scored and timed using the FinishLynx timing system. Nike is providing singlets to the athletes. The field includes a number of state champions from a range of class divisions, including top seed and defending B2B Mile champ Lily Horne of Freeport High School (left), who won Class B titles in both the 1,600-meter and 3,200-meter in June, and top seed Lisandro Berry-Giviria, who also doubled up at the Class A state meet. See full bib list below. 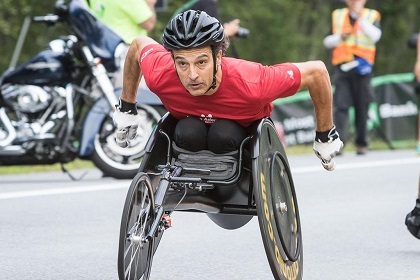 After a record 10 wheelchair athletes competed in the special 20th anniversary race in 2017 (a field of 10 also competed in 2012 for the 15th anniversary), the assumption was the field size would shrink once more to between-an-anniversary levels – three in 2016, four in 2015. Not the case. The momentum has carried over and this year a record 13 wheelchair athletes are set to compete for $3,500 in prize money, provided by UNUM, split $1,000/$500/$250 for each race. In addition, the field is more balanced with eight men and five women – between 2012 and 2017, there hadn’t been more than one woman competing each year. Three women were in the field last year. On the women’s side, all three competitors from 2017 are back and will be joined by a pair of newcomers in what is expected to be the most competitive women’s race in TD Beach to Beacon history. Defending champion Hannah Babalola, 29, of Nigeria won last year in 28:26, 90 seconds ahead of Yen Hoang, 21, of Champaign, Ill. But two new competitors, Katrina Gerhard, 21, of Ashburnham, Mass., and Michelle Wheeler, 31, of Boalsburg, Penn., project to finish right around 26:00, which likely means spectators are in for a tight finish. Five-time champ Christina Kouros, 23, of Cape Elizabeth, who placed third last year, also is in the field. For the men, defending champion Krige Schabort is not returning, but there is no shortage of talent. Ten-time champion Tony Nogueira, 50, of Glen Ridge, N.J., who finished 2nd in 2017, is back, along with James Senbata, 25, of Champagne, Ill., who set the course record (21:46) in 2015 and took 3rd a year ago. Hermin Garic, 28, of Utica, N.Y., Gary Brendel, 59, of Sterling, Mass., Jason Robinson, 15, of Rome, N.Y., and Richard Agee, 38, of Irvington, Ky., also are returning and will compete for a podium spot. The race also welcomes two newcomers, Matt Davis, 51, of Bowling Green, Ky., and Shannon Franks, 41, of College Park, Md. The wheelchair athletes will again be hosted by The Landing, an assisted living facility in Cape Elizabeth which will host a pre-race event. Details are forthcoming. Each year, families from Cape Elizabeth and surrounding areas open their homes – and their arms – to elite athletes from around the world. These incredible athletes who arrive from East Africa, Europe, the Far East and elsewhere around the globe (and the U.S.) connect with families in Maine for a cultural experience that rewards both the host family and the athlete. The race’s home stay program is one of the most popular and among the world-class distance runners – it’s a main reason why some athletes want to return year after year. We can help arrange interviews with families or help media do a story on the program itself, which promotes cultural awareness as athletes and their host families often swap recipes, customs and stories. More and more local families from the area get involved each year; however, there are some families who have participated for many years now. And those bonds between athlete and family are growing stronger and more connected. We can supply names of families and their runners. The TD Beach to Beacon 10K has a long history of commitment to the environment. In 2016, the race achieved highly coveted Evergreen status, becoming the first major road race of its size in North America – and only the sixth event ever worldwide – to earn the distinction, said Bruce Rayner of Athletes for a Fit Planet, the race’s sustainability consulting partner. As the TD Beach to Beacon 10K continues to grow, organizers are committed to finding new and innovative ways to improve on its already-impressive program, including a long-term objective of maintaining and strengthening the commitment to “zero waste” status. 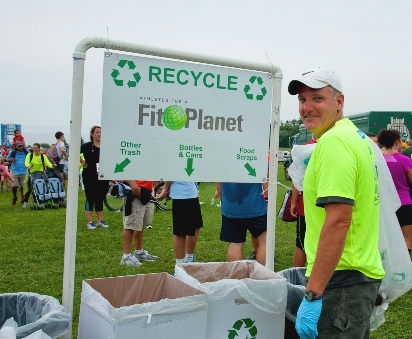 Recycling and composting waste at the expo and the race – including the start, water stops and the finish. The goal of the Green Team is to ensure the race recycles all plastic, cardboard and paper, and composts all food waste. In 2016, the race recycled and composted 90% of the 6.3 tons of waste. Collecting the plastic water bottles at the finish, redeeming them with CLYNK, and donating the proceeds to the official race charity. In 2016, the race redeemed 5,088 bottles. Free bike parking provided runners, volunteers, and spectators at Fort Williams in partnership with the Bicycle Coalition of Maine. A total of 240 runners, volunteers and spectators took advantage of the program in 2016. Those interested in the service MUST register at https://raceroster.com/events/2018/18187/td-beach-to-beacon-bike-valet-rsvp. Give worn-out shoes a brand-new life. Instead of throwing old sneakers out, participants are encouraged to toss them into the Nike Reuse-A-Shoe bins at the Expo. They are then recycled to be used in new places to play and train - like tracks, field, courts and playgrounds. Athletic shoes only, any brand OK, no damp or muddy shoes, no metal, cleats or dress shoes, no sandals or flip-flops. Visit www.nikereuseashoe.com for more info. Rideshare to the race. Every mile driven produces about a pound of CO2. To help reduce the race’s carbon footprint, runners, family and spectators are encouraged to share a ride to the Expo and the race and/or use satellite parking and take a shuttle bus. Offset carbon footprint. The race offers runners the opportunity to offset their carbon emissions resulting from travel. Athletes for a Fit Planet is partnered up with Native Energy to offer a cheap and convenient way to offset the CO2 emissions from you travel. For $3, you can buy a Green Tag that offsets 300 pounds of CO2, which is about 300 miles of travel. Eco-friendly portable toilets. They use only recycled paper and non-toxic chemicals. Satellite parking. Race organizers are providing transportation to and from the race from satellite parking lots at the Hannaford corporate headquarters in Scarborough and SMTC in South Portland as well as from the Cape Elizabeth High School and Middle School lots. Non-toxic paint. Brite Stripe Ultra-Friendly, the turf industry’s only VOC-free paint and the only one to receive EPA approval, is used for the Start and Finish lines. Paperless registration. Runners register online only, and the majority of the race’s communications to runners are conducted via e-mail and through its website. Media Contact: Contact Bruce Rayner, Chief Green Officer at Athletes for a Fit Planet – (508) 380-0868 bruce@afitplanet.com.. Without the help of title and lead prize money sponsor TD Bank, America’s Most Convenient Bank®, and the race’s other corporate partners, the TD Beach to Beacon 10K would not be the world-class event that it is. TD Bank met with Olympic Gold Medalist Joan Benoit Samuelson more than 20 years ago to create this premier running event in her home state, beginning in 1998. Corporate partners Nike, Hannaford, Poland Spring and MaineHealth also jumped on board that first year and have supported the race ever since. Other long-time Corporate Partners include IDEXX, L.L.Bean, NEWS CENTER Maine, Northeast Delta Dental, Olympia Sports, ON Semiconductor and Dunkin’ Donuts. Also, Oakhurst Dairy, another veteran race sponsor, will again present both youth-focused events – the B2B High School Mile and the Kids Fun Run – in Fort Williams on the eve of the 10K race. Larry Wold, President of TD Bank in Maine, is among the 113 legacy runners who have taken part in all 20 previous TD Beach to Beacons. Wold, 59 a Freeport resident, is an active member of the community and is involved in a number of fundraising events and causes. He joined the company in 1991. If interested in a story about someone who is a leader at TD Bank AND has run each of the first 20 races – and will run his 21st this year, Wold would make a great feature story. Plus, he’s no slouch as a runner. Like almost all aspects of the TD Beach to Beacon 10K, the race’s Expo rates right up there for variety and the sheer number of vendors. There is something for everybody. The Expo runs alongside bib and t-shirt pick up, which is from 4 p.m. to 8 p.m. at Cape Elizabeth High School Thursday and Friday, Aug. 2 and 3. TD Bank, MaineHealth, Northeast Delta Dental, L.L.Bean, Nike, Hannaford, Thos. Moser, Oakhurst Dairy, Athletes for a Fit Planet, Poland Springs, WinterKids, Dream Big, Maine Track Club, National Running Center, Terra Cotta Pasta, Spectrum Healthcare, AAA of Northern New England, Cabot Cheese, Fleet Feet Maine Running, Ocean House Realty, Ocular Eyewear, Family Chiropractic Associates, Cape Elizabeth Cross Country, Handy Spandy, Fartlek Jewelry, Bermuda 26.2, Innate Family Chiropractic, Back in Motion Physical Therapy, Riverview Martial Arts School, AdvoCare, Bondi Band, Mana Threads, Renewal by Anderson, BeeCause Charms, Moving Maine Forward and Strive. Race beneficiary WinterKids also will have a booth. With the flurry of activity, anticipation and interesting exhibits and giveaways, the Expo and registration are an ideal pre-race photo op. TD Beach to Beacon founder Joan Benoit Samuelson, 61, is a running icon who remains Maine’s most well-known and accomplished athlete. She is an inspiration and a role model for girls and women around the globe. 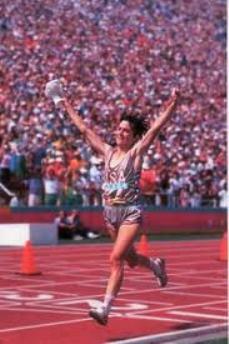 Her quiet determination, on display for the entire world to see during her marathon victory at the 1984 Olympics, played a key role in making her dream of staging a major road race in Cape Elizabeth a reality. Joan works tirelessly on the race that she started as evidenced by her race-day activities, which includes presiding at the start, personally greeting hundreds and hundreds of runners at the finish, posing for pictures and welcoming dignitaries, and quite often helping with the post-race cleanup. She also operates behind the scenes recruiting top athletes to the race and working on keeping and growing sponsorships. Joan also continues to inspire on race courses around the country by competing at a high level still, setting numerous age-group records along the way - including in her own race, where she set a new best American 10K time for her 60-64 age group (39:19) at the 2017 TD Beach to Beacon. But Joan’s legacy goes well beyond her records. She is a strong advocate for the environment, children and healthy choices. Media Morning at the Fort Aug. 1: Wolfe PR has organized a “Media Morning at the Fort with Joanie” – e-mail, call or text Beryl Wolfe to schedule a one-on-one, 15-minute interview beryl@wolfenews.com (520) 399-5770. Media Contact: To set up interviews with Joanie re: the race, contact Beryl at Wolfe PR, beryl@wolfenews.com. Does Race Director Dave McGillivray ever rest? Seriously. McGillivray, who also directs the B.A.A. Boston Marathon, has had quite a year so far – with much more to come. He kicked off 2018 by flying around the globe to complete the World Marathon Challenge – seven marathons in seven days on seven continents. This from a man who is fewer than five years removed from a diagnosis of coronary heart disease, which prompted him to change his diet, eliminate stress and rededicate himself to fitness. But not stop. No way. In April, McGillivray, 63, ran his 46th straight Boston Marathon, including the last 31 at night after completing his duties directing the world-famous race. Also this spring, he published a children’s picture book called “Dream Big”, about his first attempt at running the Boston Marathon and based on his 2006 autobiography, “The Last Pick”. Known as an inspirational speaker, McGillivray has managed to squeeze in countless talks to schoolchildren and other groups this year. And later this month, McGillivray will complete his annual birthday run – running his age in miles – with a 64-mile jaunt. He has completed his birthday run every year since age 12. Next month, McGillivray will mark the 40th anniversary of his historic solo 3,452-mile run across the U.S. – from Medford, Oregon to his native Medford, Mass. – with a celebration in Medford that will culminate as it did in 1978 with him running into Fenway Park to the cheers of the crowd before a Red Sox game. The Aug. 23 event is aimed at raising money to benefit the Jimmy Fund. McGillivray and his event management company, DMSE Sports, are pioneers in what is now one of the most important aspects of the endurance sports industry – combining athletics with philanthropy. 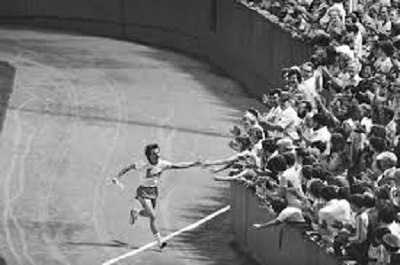 Runner’s World said his 1978 achievement was one of first times someone combined running with fundraising for cancer research. It marked the first of many feats of endurance for McGillivray over four decades, always to raise money. He and the races he has managed through DMSE Sports have raised millions for charity over the years. Speaking of which, the next day, on Aug. 24, McGillivray will direct the second annual Fenway Park Marathon, an event organized by DMSE Sports that last year raised $320,000 for the Red Sox Foundation. Whew. Oh, that’s right. McGillivray is putting the finishing touches on his second children’s illustrative book titled “The Home Run”, which chronicles his 1978 cross country run. Proceeds from the new book, which will be released in 2019, will go the a charity. Of course. The largest world-class field in race history will descend on Cape Elizabeth on a quest for prize money, personal bests and, truth be told, lobster. For the fourth year, Dunkin’ Donuts is providing the $23,000 prize purse for American men and women – a development that has helped transform the TD Beach to Beacon into a ‘must’ event for many of the top U.S. distance runners. In fact, 28 of America’s best have entered the race (as of July 17). The American prize money is split evenly among the top five men and women and breaks down like this: $5,000 for first, $3,000, $2,000, $1,000 and $500. The men’s and women’s winner in the Open category of the race receives $10,000 (with money descending down 10 places), courtesy of TD Bank, so an American overall winner would pocket a total of $15,000 in prize money – like Ben True did in 2016! In addition, a $2,500 bonus, sponsored by Northeast Delta Dental, is available for a new course record in the Open category, which Mary Keitany of Kenya took home in each of her victories in 2016 and 2017. .
South Sudan-born Lopez Lomong, 32, is a two-time U.S. Olympian who won the USATF 10,000m title in June. He success on the track is made all the more poignant by the fact he also is one of “The Lost Boys of Sudan”, the name given to a group of more than 40,000 boys displaced or orphaned during nearly 20 years of civil war in their African country. Lopez’s story is one of survival against long odds. He was abducted at age six, presumed dead by his family, and nearly died in captivity before he managed to escape by running for three days until reaching the Kenyan border. He then spent 10 years in a refugee camp before he was resettled in the U.S. in 2001. In 2007, Lopez became a U.S. citizen. A year after that, he served as flag bearer as a member of the 2008 U.S. Olympic team. He also competed at the 2012 Olympic Games, finishing 10th in the 5000m. Olympic champion triathlete Gwen Jorgensen, 32, is making a stop in Cape Elizabeth on her quest to achieve greatness as a marathoner. A dynamic athlete, the two-time Olympian won the USA’s first-ever triathlon gold medal at the 2016 Rio Olympics. She also was the World Champion triathlete in 2014 and 2015. Last fall, a few months after giving birth to her first child, Jorgensen announced that she was retiring from the triathlon to focus on the marathon, with a goal to win Olympic marathon gold in Tokyo in 2020. Jorgensen, who was an All-American in track and cross country at the University of Wisconsin, will be running her fifth competitive race on Aug. 4. She won a 10,000m invite at Stanford in March (31:55.68), took 4th at the USATF Half Marathon Championship (1:10:58) in May, finished 7th at the USATF 10,000m in June, and took 5th at the USATF 10K Championship at the Peachtree Road Race in July. Jake Robertson, 28, who made headlines 10 years ago when he and his twin brother, Zane, then 17, decided to skip college and instead move from their native New Zealand to live and train in Kenya, where they still live. The decision is paying off as Zane competed at the 2016 Rio Olympics and Jake is now coming into his own as one of the top distance runners in the world. In January, Jake won the Houston Half Marathon (60:01) in one of the strongest half marathon fields ever assembled on U.S. soil. He followed up that performance by setting the New Zealand marathon record at the Lake Biwa Marathon in Japan, and breaking the 10,000m national record mark as well (27:30.9) while placing 5th at the 2018 Commonwealth Games. He also won the 2018 Crescent City Classic 10K title in New Orleans in an eye-opening 27:28. 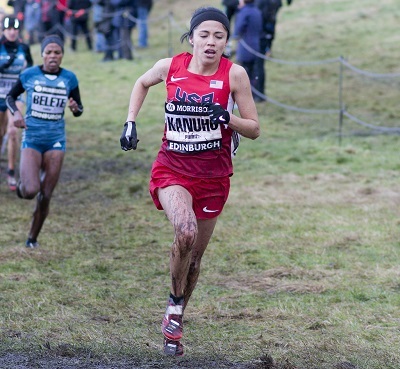 Rochelle Kanuho, 28, is a diminutive runner who made a big impression on the national running stage in the 10,000m at the 2016 U.S. Olympic Trials when she scrapped and clawed her way to move up 11 spots from her seed position and finish 7th. But then again, that has been Rochelle’s formula for survival her entire life. Born in Flagstaff, Ariz., of Native American and Mexican descent, she was raised by her single mother, moving in and out of motels, apartments and trailers and transferring from school to school throughout her childhood. She never lived with her seven half brothers and sisters and didn’t meet her biological father until she was 16. Sports became her outlet. Known for her grit and determination, Rochelle overcame family struggles to become a track and cross-country standout in high school. Encouraged by her coaches to apply to college, she got into Northern Arizona University. Her times were not good enough to make the team as a walk on, so she worked hard and started eating better and eventually ran well enough to earn a scholarship for her final three years. She did well and after graduating, despite the lack of a sparkling resume, Rochelle decided to pursue running as a professional. She remains a work in progress but is getting better all the time, as evidenced by some good showings so far in 2018 – 6th at the USATF 10,000m and 5th at the USATF 15K Championships. Don’t count her out, ever. Leading the marathon by two minutes with just over a mile to the finish line at the 2018 Commonwealth Games in April, Great Britain Olympian Callum Hawkins was set for a remarkable gold in a race he’d likely never forget. But turns out, that’s about all he remembers. In a sequence that shocked a live global TV audience, the 26-year-old Scottish runner started to weave, fell over a curb, got back on his feet and continued before collapsing again, this time hitting his head on a roadside barrier. Here’s a clip: https://www.youtube.com/watch?v=JeIR1GW8USo. The scorching conditions on the east coast of Australia had taken a toll, leaving him severely dehydrated and in distress. The next thing he remembered, Hawkins told the BBC, he was in an ambulance. “The first thing I asked (was) did I win because I thought there might have been a chance that I went on autopilot and finished it,” he said. “But nobody answered me and I knew straight away, eh that’s a no.” He should find more favorable weather conditions in Maine. Hawkins, who holds the Scottish half marathon record (60:00), finished 9th in the marathon at the 2016 Rio Olympics, 2nd at the 2017 NYC Half Marathon and 4th at the 2017 World Championships marathon, equaling the best ever performance by a British runner in the event. 25-year-old Annika Pfitzinger’s home is in New Zealand, but her last name might ring a bell for followers of American distance running. Her father is two-time Olympian Pete Pfitzinger, the top American finisher in the 1984 and 1988 Olympic marathons. He established himself as one of the best marathoners in U.S. history by outkicking Alberto Salazar to win the 1984 U.S. Olympic Trials. That’s dad. Mom is New Zealand track Olympian Christine Pfitzinger. Quite the pedigree. But no pressure, right Annika? Recent Utah State graduate Dillon Maggard, 22, has a bright future in distance running. In fact his future is so bright, he has to wear….blue jeans?? The nine-time All-American set a school record while placing 3rd in the 10,000m (29:16.20) and also 6th in the 5,000m at the NCAA Div. 1 Outdoor Championships in Eugene. He also placed 6th at the 2017 NCAA Cross Country Championships. Now about those blue jeans. Dillon is the proud holder of the world record in the Blue Jean Mile. Yes, the Blue Jean Mile. 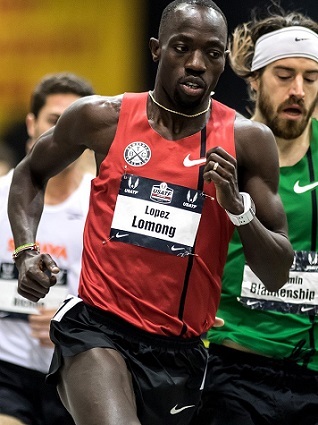 Last November on the track in Logan, Utah, he clocked a 4:11.8 – breaking the old mark of 4:16 – clad only in running shoes and a pair of cotton blue jeans he found at a thrift store. Let Dillon explain, “I picked them specifically because they were tight around the waist, somewhat loose fitting, and were, of course, the most stylish. The most surprising thing about racing in jeans was that they didn't allow me to drive my knees up very high so I felt like I couldn't get my full stride. But during the attempt, I didn't notice them that much." Here’s the video. Pretty impressive, even more so given that he achieved the mark at an elevation of 4,800 feet. 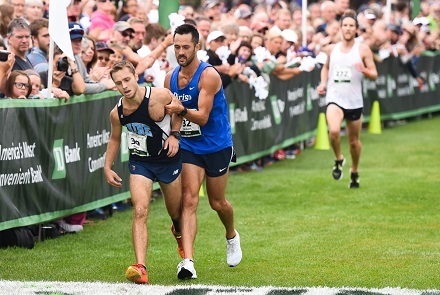 MEDIA CONTACT: FMI on the American and elite field, contact Larry Barthlow, the elite athlete director, at larry@worldeventsnetwork.com or Jason Wolfe, Wolfe PR jason@wolfenews.com (520) 399-5097.
Who can forget the ending to last year’s Maine men’s race? Nearing the finish line, race leader Jesse Orach was overcome by heat stroke and fell, only to be helped to his feet by his trailing competitor, Rob Gomez, who held Orach up as they ran together to the finish line. Gomez then provided Orach with a nudge over the line to give him first. This selfless act of sportsmanship by Gomez was the feel-good story of the year in road racing, capturing attention nationally and around the globe. “This is perhaps one of the most inspirational stories, if not the most inspirational story, that the TD Beach to Beacon has told to date, and it happened at the finish line,” race founder Joan Benoit Samuelson would say later. Both runners are back in the field for 2018. They have since formed a friendship and are teammates as part of the Dirigo running club. Orach, 24, of Gorham, who last year became the first repeat winner in the Maine men’s race since Ben True in 2008-09, will seek to become the first three-time champion. He is a former academic All-American at the University of Maine. Gomez, 35, of Windham, has never won the Maine race (and passed on the chance last year), but has a handful of top 5 finishes. 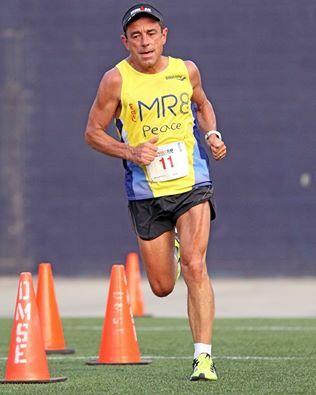 The winner of the Maine Marathon in 2013, he remains one of the state’s most prolific and successful road racers. They are expected to be challenged by a pair of runners who would like nothing more than to win the TD Beach to Beacon and earn the (unofficial) title as the state road race champion. 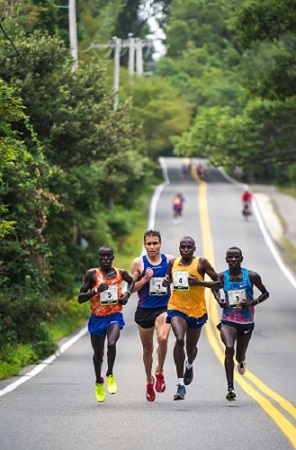 Fellow Dirigo runner Ben Decker, 22, of Yarmouth, the 2015 champ, ran 30:07 on the track in May (31:31 won the TDB2B in 2017) and could be the favorite, while Ryan Smith, 23, of Farmington, will arrive in Cape Elizabeth as perhaps the hottest runner in the field. He won the L.L. Bean 10K earlier this month, finished behind Orach and just ahead of Decker in the YMCA Fit Fest 5K in June, and beat Gomez in the Patriot 5K in May. On the women’s side, two-time champ Michelle Lilienthal, 36, of Portland is again the favorite to re-claim the crown she last won in 2016. She also won in 2014 with a course record 33:39. Defending champion Emily Durgin has moved out of state and is returning to compete as an elite athlete in the Open category. Other contenders include Sheri Piers, 47, Falmouth, a three-time Maine champ and former course record holder; Erica Jesseman, 29, of Scarborough, a two-time winner; Tracy Guerrette, 36, of Saint Agatha, who finished third in 2017; and Taylor Bickford, 24, of Limington, who placed fifth last year. MEDIA CONTACT: Former race president David Weatherbie dweatherbie@seafax.com can provide valuable insights into the status of Maine runners. A range of health topics for runners, including how to maximize runner performance and prevent injuries through gait training, will be discussed as part of a Sports Medicine Symposium on Thursday, Aug. 2 at Maine Medical Center in Portland. 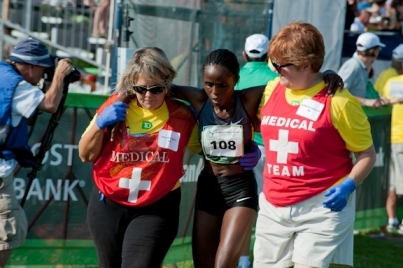 The medical tent at the TD Beach to Beacon brings together physicians, EMTs, nurses and other medical professionals from across the region who volunteer their time to provide top-notch medical care to runners. The race has a reputation as one of the safest 10Ks in the world. Media Contact: Chris Troyanos, Medical Coordinator of the TD Beach to Beacon 10K troyanos@comcast.net. The volunteer effort at the TD Beach to Beacon 10K is huge and is often taken for granted. It shouldn’t be. Coordinating more than 800 volunteers is a monumental task that requires patience, perseverance and a certain amount of guile. Volunteer Director Maya Cohen of Cape Elizabeth has developed and each year executes a program that involves coordinators who oversee volunteers in more than 20 different areas, from the B2B High School Mile and Kids Fun Run on Friday to the Medical Tent to water stations, parking, security, course set up and breakdown, and the award-winning sustainability efforts. Those interested register online at http://www.beach2beacon.org/VOLUNTEER. Race weekend now includes a more coordinated, youth-focused slate of activities on pre-eve Friday at Fort Williams. 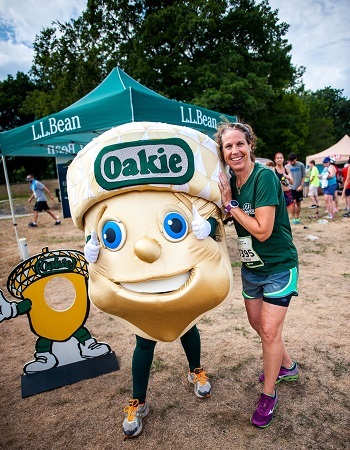 Oakhurst Dairy will again present both the Kids Fun Run and the B2B High School Mile, keeping Oakie the Oakhurst Acorn busy. The high school mile event, now in its third year, continues to exceed expectations, drawing many of Maine’s top young runners and also attracting hundreds of spectators to cheer them on. The athletes run a two-loop course beginning near the Portland Head Light and ending across the official TD Beach to Beacon finish line in Fort Williams. The event is set for 4 p.m. The Kids Fun Run, set for 6 p.m. at the Soccer Fields at Fort Williams, remains one of the most photogenic and popular aspects of race weekend. Open to children 12 and under, with different distances for different age groups, the races are run in heats according to age. Refreshments and finishing prizes are handed out after the races. Race beneficiary WinterKids is planning to add a wintery touch to the event, providing snow cones, hosting the L.L. Bean Bootmobile and featuring two of Maine’s Winter Olympians, Seth Wescott and Julia Clukey. Joan Benoit Samuelson, Race Director Dave McGillivray (who recently authored a children’s book, Dream Big) and a host of elite athletes also will be on hand to help with both the events. NOTE TO REPORTERS/EDITORS: For more information or assistance with any of the above items that do not contain contact info, please contact Beryl or Jason Wolfe at Wolfe PR – (520) 399-5770 or 5097, or by e-mail, beryl@wolfenews.com, jason@wolfenews.com. Also, bios, a Fact Sheet, past results, statistics, news releases, a course map and other race materials are available at www.wolfenews.com and on the race website. Thanks!